Since its inception just over four years ago I have been quite heavily involved with the ‘Friends of Downlands’ and have worked with Sue Sayers for all of that time. 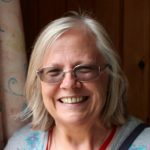 Without Sue’s local knowledge of the various organisations who will help and donate and her experience in her field, ‘Friends of Downlands’ would not be able to operate in the way that it does. Her organisation of the volunteers is second to none and it is because of these that ‘Friends of Downlands’ has become as successful as it is. When I first became chairman I had no clue of what was expected of me, but with Sue’s guidance and help I think we make a good team. The newsletter we produce is always scrutinised by her before publication and anything she feels untoward will be edited out and replaced. Sue is always on the lookout for alternative methods of grants and funding and many a long hour has been put into the applications most of which have been rewarding. This group was established in early 2010 and I attend their meetings and work with them to attract funding to support the activities that take place at Downlands Court. I worked with this group to adopt their constitution and now support their AGMs each year. I meet with this group approximately every two months and together we plan the programme of monthly outings. I recruit and support the volunteers that facilitate activities at Downlands Court. In any quarter, we average of 25 volunteers who contribute over 500 hours of their time. Our volunteers range in age from 21 to 90. Volunteers and residents, supported by myself and the scheme manager, organise a full programme of activities which include chair-based exercise, creative writing, bingo, Scrabble, film club, card-making, puzzle time, baking group, painting and drawing & outings. Friends of Downlands secured Heritage Lottery Funding ‘All Our Stories’ grant which has enabled me to establish and develop a local history group which meets monthly at Peacehaven Library. We have joined with Peacehaven Community School to enjoy intergenerational Boccia games and we are invited to their Christmas production. Special needs students interviewed our residents about childhood memories and then used their findings to complete some creative writing. Drama students joined with members of Peacehaven Pioneers to learn about the development of Peacehaven and how participants used to fill their leisure time, in order to develop background knowledge for their musical drama on the life of Felix Powell (who lived in Peacehaven and wrote ‘Pack Up Your Troubles’).